Buy high quality tennis nets direct from Oxley Nets. Shipping available across Australia. At Oxley Nets we're famous for our tennis nets and tennis court netting. For over 100 years, we've been the supplier of choice for tennis nets around Australia - for all of the major tournaments, clubs and home courts. With a range of high quality nets to choose from, strength and durability are our trademarks. All nets come with a three year guarantee. Our specialist knowledge and years of experience, along with the expertise of our engineering staff, allow us to develop a tennis court perimeter netting solution with the client that is both cost effective and suited to the needs of the individual tennis court. As the supplier of tennis nets to the Australian Open, Sydney Olympics and countless club and private courts across Australia, Oxley Nets can supply the exact quality tennis net from our range, to suit your requirements and budget. For new court installations or court refurbishments, we also offer tennis net posts and tennis net winders to suit. The use of retractable tennis court nets, tennis curtains, around the perimeter of tennis courts or as court dividers for multiple tennis court installations, provides an economical and flexible alternative to rigid fixed chain wire fencing. Tennis court netting provides the same levels of safety and convenience for spectators and players, but features the benefit of allowing the tennis court to be opened up for other sporting, function or open area activities. All tennis nets are supplied with 5mm cable, webbing tops and all the fittings required for installation to your posts. 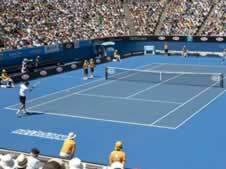 OXLEY NETS can custom manufacture tennis nets as supplied to the Australian Open, Royal South Yarra & Kooyong events. We can also supply high quality half court tennis nets, customised to suit - please call us on 1300 730 731 to discuss your needs. We now stock portable mini tennis net sets in 4m long and 6m long options for kids to enjoy at home or at the park. The net comes with black posts and ground bar, and is stored in a carry bag. An image of the product can be seen in the above gallery.